QUT scientist and humanitarian, Distinguished Professor James Dale, who has developed potentially lifesaving bananas for some of the poorest people on earth is the 2019 Queensland Senior Australian of the Year. The Senior Australian of the Year along with other award categories will be announced by Prime Minister Scott Morrison in Canberra this Friday evening, 25 January. Professor Dale, an agricultural biotechnologist, and his team have enriched East African bananas in Uganda with pro-vitamin A in efforts to significantly improve nutrition and prevent a vitamin deficiency which leads to the annual deaths of an estimated 670,000 children in developing countries and blindness in another 400,000. “As a result of research conducted over more than a decade, we’ve been able to develop a banana that has achieved excellent pro-vitamin A levels, hence the golden-orange rather than cream-coloured flesh,” Professor Dale said. 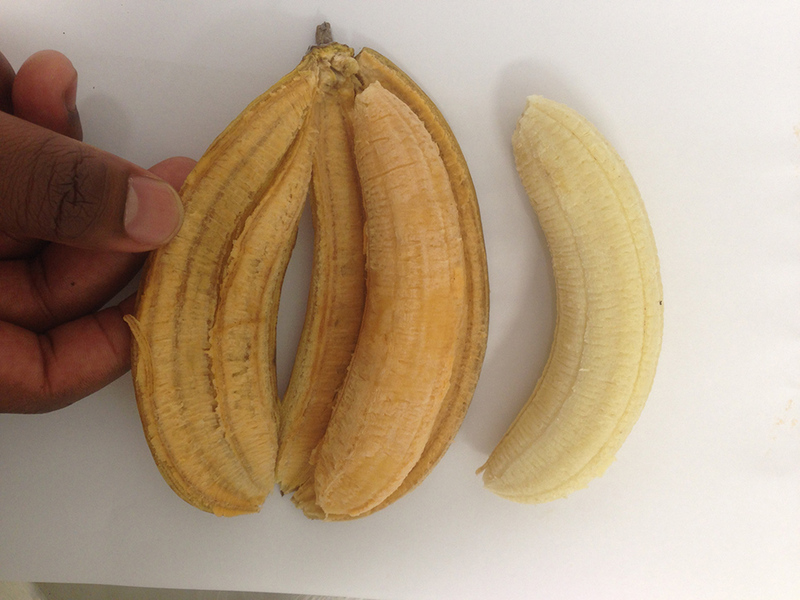 Golden banana (left) is high in pro-vitamin A. Professor Dale said another really pleasing aspect of the project was the fact that young Ugandan students, who came to QUT to undertake their studies, had now completed their PhDs and were overseeing the research and field trials in Uganda. The research was backed with close to $20 million from the Bill & Melinda Gates Foundation and the UK Government’s Department for International Development. Professor Dale and his team have also developed a genetically modified (GM) Cavendish banana strain that could save the variety which is under global threat from Fusarium wilt or Panama Disease tropical race 4 (TR4). “TR4 can remain in the soil for more than 40 years and there is no effective chemical control for it,” Professor Dale said. “It is a huge problem that has devastated Cavendish plantations in many parts of the world and is spreading rapidly across Asia. Professor Dale’s world-first GM field trial conducted in heavily TR4-infested soil is currently underway in the Northern Territory. He is also leading a team at QUT to develop a non GM Panama disease-resistant Cavendish banana. Professor Dale was the inaugural Director of the Centre for Tropical Crops and Biocommodies at QUT and founded Australia’s first molecular farming company, Farmacule Bioindustries.